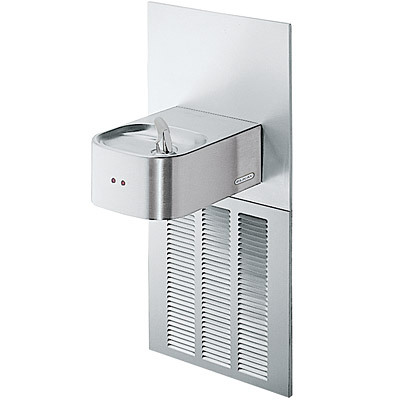 The Elkay EROM8K Water Cooler is a single, barrier-free stainless steel unit that has recessed in-the-wall refrigeration system and stainless steel grill. All stainless steel polished to a satin finish and a vandal-resistant bottom cover plate is included. The Elkay EROM8K is sensor-operated with a unique Hands-Free® operation and automatic flow regulator provides constant stream from 20 to 105 psi. The Elkay EROM8K has an energy efficient refrigeration system that utilizes a combination tank continuous-tube type evaporator, refrigerant drier, and capillary tube. The Elkay EROM8K complies with the requirements of A.D.A. (Americans with Disabilities Act) when properly installed. Also meets the guidelines for children’s environments providing the floor to orifice height is 30" or less and proper clear floor space is provided for parallel approach. (Based on Architectural and Transportation Barriers Compliance Board final ruling.) Check Local and State Codes. The Elkay EROM8K is certified to be lead-free as defined by the Safe Drinking Water Act. Elkay Water Coolers are manufactured with a waterway system utilizing copper components and completely lead-free materials. These waterways have no lead because all lead materials, such as leaded brass, have been removed. All joints are brazed using silver solder only. No lead solder is permitted. A strainer with an easily cleanable screen is provided to allow trapping and convenient removal of waterborne particulate of 140 microns and larger prior to their entry into the water cooler. On-Off solenoid valve is actuated by an infra-red light beam sensor. When light beam is interrupted by subject in front of cooler desiring a drink, the sensor actuates the solenoid valve which then opens to allow water to flow. No physical contact with cooler is required. A built in time delay is provided to prevent actuation by persons moving past cooler. There is a maximum running time of 30 seconds to prevent malicious damage to the cooler or water damage if sensor vision is blocked. Unit automatically resets when blockage is removed. LK464 drain and trap assembly included.